So, you're ready to take the plunge and begin to learn how to build your own web pages and sites? Fantastic! We've got quite a ride ahead, so I hope you're feeling adventurous. Before you dive in and start to build your web site, we need to take a little time to get your computer set up and ready for the work that lies ahead. That's what this section is all about: ensuring that you have all the tools you need installed and ready to go. This information is an excerpt from my newly-released SitePoint book, Build Your Own Web Site The Right Way Using HTML & CSS. In the following pages, I'll show you how to set up your computer -- be it PC or Mac -- so that you're ready to build a site. Then, we'll meet XHTML  and walk through the details of how to structure a web page correctly. In the process, we'll play around with elements, comments, and symbols, and we'll talk about the concept of nesting. It might sound complex, but it's not! In fact, by the end of that discussion, you'll have a working web page that displays text, links, an image and even a quote! Finally, we'll turn to the topic of Cascading Style Sheets, which we'll use to change the way elements of your web page look. We'll discuss the different ways in which you can use styles to control the way your page looks before creating our own .css file and using it - as well as tools like selectors and spans - to spruce up our web page's headings, text, and so on. Don't worry if some of these terms are unfamiliar - this excerpt, like the book itself, assumes that you have no knowledge about building web pages. The information I'll present here basically comprises the first three chapters of the book -- later chapters go on to show you how to build forms, optimize graphics for the Web, publish your site, and soup it up with plug-in tools such as blogs, image galleries, and more -- the Table of Contents  has all the details. But now, let's start to set up your computer so that you're ready to build your first web page. If you were to look at the hundreds of computing books for sale in your local bookstore, you could be forgiven for thinking that you'd need to invest in a lot of different programs to build a web site. However, the reality is that most of the tools you need are probably sitting there on your computer, tucked away somewhere you wouldn't think to look for them. And if ever you don't have the tool for the job, there's almost certain to be one or more free programs available that can handle the task. We've made the assumption that you're already on the Internet -- your web site wouldn't be of much use without it! And, though it's not essential, it will also be handy if you have a broadband internet connection. Don't worry if you don't have broadband: it won't affect any of the tasks we'll undertake in this book. It will, however, mean that some of the suggested downloads may take a while to load onto your computer, but you probably knew that already. While you probably have some objectives, and some idea of how long you want to spend creating your site, we're going to gloss over the nitty-gritty of project planning to some extent. This is not to say that project planning isn't an important aspect to consider, but we're going to assume that because you've picked up a book entitled Build Your Own Web Site The Right Way, you probably want to just get right into the building part. As this is your first web site, and will be a fairly simple one, we can overlook some of the more detailed aspects of site planning. Later, once you've learned -- and moved beyond -- the basics of building a site, you might feel ready to tackle a larger, more technically challenging site. When that time comes, proper planning will be a far more important aspect of the job. But now, let's gear up to build our first, simple site. The markup above is the most basic web page you'll see here. It contains practically no content of any value (at least, as far as someone who looks at it in a browser is concerned), but it's crucial that you understand what this markup means. Let's delve a little deeper. This is known as the doctype (short for Document Type Declaration). It must absolutely be the first item on a web page, appearing even before any spacing or carriage returns. Have you ever taken a document you wrote in Microsoft Word 2003 on one computer, and tried to open it on another computer that ran Word 97? Frustratingly, without some pre-emptive massaging when the file is saved in the first place, this just doesn't work. It fails because Word 2003 includes features that Bill Gates and his team hadn't even dreamed of in 1997, and Microsoft needed to create a new version of its file format to cater to these new features. Just as Microsoft has many different versions of Word, so too are there different versions of HTML, the latest of which is XHTML. Mercifully, the different versions of HTML have been designed so that this language doesn't suffer the same incompatibility gremlins as Word, but it's still important to identify the version of HTML that you're using. This is where the doctype comes in. The doctype's job is to specify which version of HTML the browser should expect to see. The browser uses this information to decide how it should render items on the screen. The doctype above states that we're using XHTML 1.0 Strict, and includes a URL to which the browser can refer: this URL points to the W3C's specification for XHTML 1.0 Strict. Got all that? Okay: jargon break! There are too many abbreviations for this paragraph! URL: URL stands for Uniform Resource Locator. It's what some (admittedly more geeky) people refer to when they talk about a web site's address. URL is definitely a useful term to learn, though, because it's becoming more and more common. W3C: W3C is an abbreviation of the name World Wide Web Consortium, a group of smart people spread across the globe who, collectively, come up with proposals for the ways in which computing and markup languages that are used on the Web should be written. The W3C defines the rules, suggests usage, then publishes the agreed documentation for reference by interested parties, be they web site creators like your good self (once you're done with this book, that is), or software developers who are building the programs that need to understand these languages (such as browsers or authoring software). The W3C documents are the starting point, and indeed everything in this book is based on the original documents. But, trust me: you don't want to look at any W3C documents for a long time yet. They're just plain scary for us mere mortals without Computer Science degrees. Just stick with this book for time being -- I'll guide you through! The html Element: So, the doctype has told the browser to expect a certain version of HTML. What comes next? Some HTML! An XHTML document is built using elements. Remember, elements are the bricks that create the structures that hold a web page together. But what exactly is an element? What does an element look like, and what is its purpose? A tag consists of an opening angled bracket (<), some text, and a closing bracket (>). Inside a tag, there is a tag name; there may also be one or more attributes. Let's take a look at the first element in the page: the html element. Figure 2.2 shows what we have. HTML elements can have a range of different attributes; the available attributes vary depending on which element you're dealing with. Each attribute is made up of a name and a value, and these are always written as name="value". Some attributes are optional, while others are compulsory, but together they give the browser important information that the element wouldn't offer otherwise. For example, the image element (which we'll learn about soon) has a compulsory 'image source' attribute, the value of which gives the filename of the image. Attributes appear in the opening tag of any given element. We'll see more attributes crop up as we work our way through this project, and, at least initially, I'll be making sure to point them out, so that you're familiar with them. Back to the purpose of the html element. This is the outermost "container" of our web page; everything else is kept within that outer container -- there are no exceptions! Let's peel off that outer layer and take a peek at the contents inside. There are two major sections inside the html element: the head and the body. It's not going to be difficult to remember the order in which those items should appear, unless you happen to enjoy doing headstands. The opening <title> and closing </title> tags are wrapped around the words "Untitled Document" in the markup above. Note that the <title> signifies the start, while the closing </title> signifies the end of the title. That's how closing tags work: they have forward slashes just after the angle bracket. The "Untitled Document" title is typical of what HTML authoring software provides as a starting point when you choose to create a new web page; it's up to you to change those words. However, if you're creating a web page from scratch in a text editor (like Notepad), you will, I hope, remember to type something a little more useful. But just what is this title? Time for a screenshot: check out Figure 2.3. 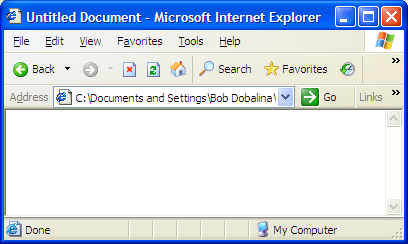 It's the name that appears in the Windows Taskbar for any open document, as shown in Figure 2.4. It also appears in the dock on a Mac, as Figure 2.5 illustrates. When you have a few windows open, you'll appreciate those people who have made an effort to enter a descriptive title! If users decide to add the page to their bookmarks (or favorites), the title will be used to name the bookmark, as Figure 2.6 illustrates. Your title element is used heavily by search engines to ascertain what your page contains, and what information about it should be displayed in the search results. Just for fun, and to see how many people forget to type in a useful title, try searching for the phrase 'Untitled Document' in the search engine of your choice. meta elements can be used in a web page for many different reasons. Some are used to provide additional information that's not displayed on-screen to the browser or to search engines; for instance, the name of the page's author, or a copyright notice, might be included in meta elements. In the example above, the meta tag tells the browser which character set to use (specifically, UTF-8, which includes the characters needed for web pages in just about any language). There are many different uses for meta elements, but most of them will make no discernible difference to the way your page looks, and as such, won't be of much interest to you. If you're thinking that the doctype and meta elements are difficult to remember, and you're wondering how on earth people commit them to memory, don't worry: most people don't! Even the most hardened and world-weary coders would have difficulty remembering these elements exactly, so most do the same thing -- they copy from a source they know to be correct (most likely from their last project or piece of work). You'll probably do the same as you work with project files for this book. Fully-fledged web development programs, such as Dreamweaver, will normally take care of these difficult parts of coding. Finally, we get to the place where it all happens! The body element of the page contains almost everything that you see on the screen, including headings, paragraphs, images, any navigation that's required, and footers that sit at the bottom of the web page. Actually, that heading's a bit of a misnomer: we've already showed you the most basic page (the one without any content). However, to start to appreciate how everything fits together, you really need to see a simple page with some actual content on it. Let's have a go at it, shall we? Open your text editor and type the following into a new, empty document (or grab the file from the code archive if you don't feel like typing it out -- I understand completely!). Example 2.1. basic.html <!DOCTYPE html PUBLIC "-//W3C//DTD XHTML 1.0 Strict//EN" "http://www.w3.org/TR/xhtml1/DTD/xhtml1-strict.dtd"> <html xmlns="http://www.w3.org/1999/xhtml"> <head> <title>The Most Basic Web Page in the World</title> <meta http-equiv="Content-Type" content="text/html; charset=utf-8" /> </head> <body> <h1>The Most Basic Web Page in the World</h1> <p>This is a very simple web page to get you started. Once you've typed it out, save it as basic.html. 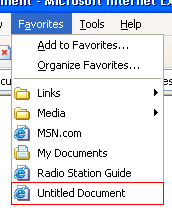 If you're using Notepad, select File > Save As from the menu and find the Web folder you created inside My Documents. Enter the filename as index.html, select UTF-8 from the Encoding drop-down list, and click Save. If you're using TextEdit on a Mac, first make sure that you're in plain text mode, then select File > Save As from the menu. Find the Sites folder, enter index.html, select Unicode (UTF-8) from the Plain Text Encoding drop-down list, and click Save. TextEdit will warn you that you're saving a plain text file with an extension other than .txt, and offer to append .txt to the end of your filename. We want to save this file with an .html extension, so click the Don't Append button, and your file will be saved. If you neglect to select UTF-8 when saving your files, it's likely that you won't notice much of a difference. However, when someone else comes along to view your web site (say, a Korean friend of yours), they'll probably end up with a screen of garbage. Why? Because their computer is set up to read Korean text, and yours is set up to create English text. UTF-8 can handle just about any language there is (including some quite obscure ones!) and most computers can read it, so UTF-8 is always a safe bet. Next, using Windows Explorer or Finder, locate the file that you just saved, and double-click to open it in your browser. Figure 2.7, 'Displaying a basic page' shows how the page displays. We've introduced two new elements to our simple page: a heading element, and a couple of paragraph elements, denoted by the <h1> tag and <p> tags, respectively. Do you see how the markup you've typed out relates to what you can see in the browser? Figure 2.8 shows a direct comparison of the document displays. The opening <h1> and closing </h1> tags are wrapped around the words "The Most Basic Web Page in the World," making that the main heading for the page. In the same way, the p elements contain the text in the two paragraphs. There's another point to note: the tags are all lowercase. All of our attribute names will be in lowercase, too. Many older HTML documents include tags and attributes in uppercase, but this isn't allowed in XHTML. In the example above, we use an h1 element to show a major heading. If we wanted to include a subheading beneath this heading, we would use the h2 element. There are no prizes for guessing that a subheading under an h2 would use an h3 element, and so on, until we get to h6. The lower the heading level, the lesser its importance and, as a rule, the smaller (or less prominent) the font. Of course, no one wants to read a document that contains only headings -- you need to put some text in there. The element we use to deal with blocks of text is the p element. It's not difficult to remember: p is for paragraph! That's just as well, because you'll almost certainly find yourself using this element more than any other. And that's the beauty of XHTML: most elements that you use frequently are either very obvious, or easy to remember once you're introduced to them. Let's imagine that you want a list on your web page. To include an ordered list of items, we use the ol element. An unordered list -- called 'bullet points' by the average person -- makes use of the ul element. In both types of list, individual points or list items are specified using the li element. So we use ol for an ordered list, ul for an unordered list, and li for a list item. Easy! To see this markup in action, type the following into a new text document, save it as lists.html, and view it in the browser by double-clicking on the saved file's icon. How does it look to you? Did you type it all out? Remember, if it seems like a lot of hassle to type out the examples, you can find all the markup in the code archive, as I explained in the preface. However, bear in mind that simply copying and pasting markup, then saving and running it, doesn't really give you a feel for what's happening -- it really will pay to learn by doing. Even if you make mistakes, it's still a better way to learn (you'll be happy when you can spot your own errors and fix them for yourself). When displayed in a browser, the above markup should look like the page shown in Figure 2.9. There are many, many different elements that you can use on your web page, and we'll meet more of them as our web site development progresses. As well as the more obvious elements that you'll come across, there are others that are not immediately obvious: what would you use div, span, or a elements for? Any guesses? Don't worry, all will be revealed in good time. Back in the garage, you're doing a little work on your project car and, as you prepare to replace the existing tires with a new set of low-profile whitewalls, you notice that your hubcaps aren't bolted on: you'd stuck them to the car with super glue. There must have been a good reason for doing that, but you can't remember what it was. The trouble is, if you had a reason to attach the hubcaps that way before, surely you should do it the same way again. Wouldn't it be great if you'd left yourself a note when you first did it, explaining why you used super glue instead of bolts? Then again, your car wouldn't look very nice with notes stuck all over it. What a quandary! When you're creating a web site, you may find yourself in a similar situation. You might build a site, then not touch it again for six months. Then, when you revisit the work, you might find yourself going through the all-too-familiar head-scratching routine. Fortunately, there is a solution! Figure 2.10 shows the page viewed on-screen. Comments must start with <!--, after which you're free to type whatever you like as a "note to self." Well, you're free to type almost anything: you cannot type double dashes. Why not? Because that's a signal that the comment is about to end -- the --> part. Oh, and did you spot how we snuck another new element in there? The emphasis element, denoted with the <em> and </em> tags, is used wherever ... well, do I really need to tell you? Actually, that last question was kind of rhetorical. It was there to make a point: did you notice that the word "really" appeared in italics? Read that part to yourself now, and listen to the way it "sounds" in your head. Now you know when to use the em element! Figure 2.11 shows how the page displays in Firefox. Remember, you write a comment like this: <!--Your comment here followed by the comment closer, two dashes and a right-angled bracket-->. Occasionally, you may need to include the greater-than (>) or less-than (<) symbols in the text of your web pages. The problem is that these symbols are also used to denote tags in XHTML. So, what can we do? Thankfully, we can use special little codes called entities in our text instead of these symbols. The entity for the greater-than symbol is &gt;; we can substitute it for the greater-than symbol in our text, as shown in the following simple example. The result of this markup is shown in Figure 2.12. Many different entities are available for a wide range of symbols, most of which don't appear on your keyboard. They all start with an ampersand (&) and end with a semicolon. Some of the most common are shown in Table 2.1. So far, we've looked at some very basic web pages as a way to ease you into the process of writing your own XHTML markup. Perhaps you've typed them up and tried them out, or maybe you've pulled the pages from the code archive and run them in your browser. Perhaps you've even tried experimenting for yourself -- it's good to have a play around. None of the examples shown so far are keepers, though. You won't need to use any of these pages, but you will be using the ideas that we've introduced in them as you start to develop the fictitious project we'll complete in the course of this book: a web site for a local diving club. The site's audience may not be enormous, but the regular visitors and club members are very keen to be involved. It's a fun site that people will want to come back to again and again, and it's a good project to work on. But it doesn't exist yet! You're going to start building it right now. Let's start with our first page: the site's home page. Let's start building this web site, shall we? Save the page, then double-click on the file to open it in your chosen browser. Figure 2.13 shows what it should look like. Apologies to anyone who doesn't get my hilarious puns on diving terminology. Come to think of it, apologies to those who do -- they're truly cringe-worthy! Hey! Where'd it All Go? You'll notice that we didn't repeat the markup for the entire page in the above example. Why? Because paper costs money, trees are beautiful, and you didn't buy this book for weight-training purposes. In short, we won't repeat all the markup all the time; instead, we'll focus on the parts that have changed, or have been added to. And remember: if you think you've missed something, don't worry. You can find all of the examples in the book's code archive. Once you've added the subheading and the paragraph that follows it, save your page once more, then take another look at it in your browser (either hit the refresh/reload button in your browser, or double-click on the file icon in the location at which you saved it). You should be looking at something like the display shown in Figure 2.14. So, the homepage reads a lot like many other homepages at this stage: it has some basic introductory text to welcome visitors, but not much more. But what exactly is the site about? Or, to be more precise, what will it be about once it's built? Beneath the content you already have on the page, add another heading: this time, make it a level three heading that reads, 'About Us' (remember to include both the opening and closing tags for the heading element). Next, add the following text. Note that there is more than one paragraph. 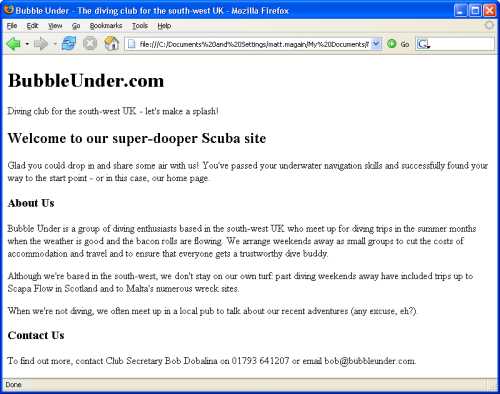 Bubble Under is a group of diving enthusiasts based in the south-west UK who meet up for diving trips in the summer months when the weather is good and the bacon rolls are flowing. We arrange weekends away as small groups to cut the costs of accommodation and travel, and to ensure that everyone gets a trustworthy dive buddy. Although we're based in the south-west, we don't stay on our own turf: past diving weekends have included trips up to Scapa Flow in Scotland and to Malta's numerous wreck sites. When we're not diving, we often meet up in a local pub to talk about our recent adventures (any excuse, eh?). If you don't feel like typing out all this content, you can paraphrase, or copy it from the code archive. I've deliberately chosen to put a realistic amount of content on the page, so that you can see the effect of several paragraphs on our display. Next, add a Contact Us section, again, signified by a level three heading. Finally, add some simple contact details as follows: To find out more, contact Club Secretary Bob Dobalina on 01793 641207 or email bob@bubbleunder.com. This clickable email link uses the a element, which is used to create links on web pages (this will be explained later in this chapter). The mailto: prefix tells the browser that the link needs to be treated as an email address (that is, the email program should be opened for this link). The content that follows the mailto: section should be a valid email address in the format username@domain. Add this to the web page now, save it, then refresh the view in your browser. Try clicking on the underlined text: it should open your email program automatically, and display an email form in which the To: address is already completed. It's still not very exciting, is it? Trust me, we'll get there! The important thing to focus on at this stage is what the content of your site should comprise, and how it might be structured. We haven't gone into great detail about document structure yet, other than to discuss the use of different levels of headings, but we'll be looking at this in more detail later in this chapter. In the next chapter, we'll see how you can begin to style your document -- that is, change the font, color, letter spacing and more'but for now, let's concentrate on the content and structure. Whoa, hold up there. Let's talk about all this img stuff (don't worry, it's pretty simple). The img element is used to insert an image into our web page, and the attributes src, alt, width, and height describe the image that we're inserting. src is just the name of the image file. In this case, it's divers-circle.jpg, which you can grab from the code archive. alt is some alternative text that can be displayed in place of the image if, for some reason, it can't be displayed. This is useful for visitors to your site who may be blind (they have web browsers, too! ), search engines, and users of slow Internet connections. width and height should be pretty obvious: they give the width and height of the image, measured in pixels. Don't worry if you don't know what a pixel is; we'll look into images in more detail a bit later. Go and grab divers-circle.jpg from the code archive, and put it into your web site's folder. The image is shown in Figure 2.16. Save the changes, then view the homepage in your browser. It should look like the display shown in Figure 2.17. Paragraphs? No problem. Headings? You've got them under your belt. In fact, you're now familiar with the basic structure of a web page. The small selection of tags that we've discussed so far are fairly easy to remember, as their purposes are obvious (remember: p = paragraph). But what the heck is a div? A div is used to divide up a web page and, in doing so, to provide a definite structure that can be used to great effect when combined with CSS. If you were to change those paragraph tags to divs, there would be very little obvious change in the page's appearance when you viewed it in a browser (as Figure 2.18 shows). "But they look exactly the same! What's the difference between using a div and a p?" you may protest. Well, the purpose of a div is to divide up a web page into distinct sections, adding structural meaning, whereas p should be used to create a paragraph of text. Never use an XHTML element for a purpose for which it was not intended. This really is a golden rule! You can have as many paragraphs as you like inside that div element, but note that you cannot place div elements inside paragraphs. Think of a div as a container that's used to group related items together, and you can't go wrong. Figure 2.19 shows how the different segments of content can be carved up into distinct areas based on the purposes of those segments. Take the homepage we've been working on (index.html) and, in your text editor of choice, add <div> and </div> tags around the sections suggested in Figure 2.19. While you're adding those divs, add an id attribute to each, appropriately allocating the names header, sitebranding, tagline, and bodycontent. Remember that attribute names should be written in lowercase, and their values should be contained within quotation marks. An id attribute set to header should not be confused with headings on the page (h1, h2, and so on); nor is it the same as the head of your HTML page. The id= attribute could just as easily have been named topstuff or pageheader. It doesn't matter, so long as the attribute name describes the purpose of that page section to a fellow human being (or to yourself 12 months after you devised it, and have forgotten what you were thinking at the time!). Now, try doing the same: apply divs to the parts of the content that we've identified as "site branding" and "tag line." We already know that divs can contain paragraphs, but a div can also contain a number of other divs. This is called nesting. It's not tricky, it's just a matter of putting one div inside the other, and making sure you get your closing tags right. As Figure 2.19 shows, some nesting is taking place: the "site branding" and "tag line" divs are nested inside the "header" div. In such cases, you might find it difficult to work out which div is being closed off at each point. It may not yet be apparent why this is important or useful, but once we start using CSS to style our pages, errors in the XHTML can have an impact. Adding some comments here and there can really help you debug later. How does the web page look? Well, we're not going to include a screen shot this time, because adding those div elements should make no visual difference at all. The changes we just made are structural ones that we'll build on later. Don't go overboard adding divs. Some people can get carried away as they section off the page, with <div> tags appearing all over the place. Overly enthusiastic use of the div can result in a condition that has become known as "div-itis." Be careful not to litter your markup with superfluous <div> tags just because you can. We've been making good progress on our fictitious site ... but is a web site really a web site when it contains only one page? Just as the question, "Can you have a sentence with just one word?" can be answered with a one-word sentence ("Yes"), so too can the question about our one-page web site. But it's not really ideal, is it? You didn't buy this book to learn how to create one page, did you? Let's take a look at how we can split the page we've been working on into separate entities, and how these pages relate to each other. First, let's just ensure that your page is in good shape before we go forward. The page should reflect the markup shown in the last large block presented in the previous section (after we added the <div> tags). If not, go to the code archive and grab the version that contains the divs). Save it as index.html in your web site's folder (if you see a prompt that asks whether you want to overwrite the existing file, click Yes). You should now have three HTML files in the folder that holds your web site files. The index.html file should stay as it is for the time being, but take a moment to rename the other two (select each file in turn, choosing File > Rename, if you're using Windows; Mac users, simply select the file by clicking on it, then hit Return to edit the filename). Rename one file as contact.html (all lowercase). Rename the other one as about.html (all lowercase). Note: Where's my File Extension? We have three identical copies of our XHTML page. Now, we need to edit the content of these pages so that each page includes only the content that's relevant to that page. To open an existing file in Notepad, select File > Open, and in the window that appears, change Files of type to All Files. Now, when you go to your Web folder, you'll see that all the files in that folder are available for opening. Opening a file in TextEdit is a similar process. Select File > Open to open a file, but make sure that Ignore rich text commands is checked. index.html -- Delete the "About Us" and "Contact Us" sections (both the headings and the paragraphs that follow them), ensuring that the rest of the markup remains untouched. Be careful not to delete the <div> and </div> tags that enclose the body content. about.html -- Delete the introductory spiel (the level two heading and associated paragraphs, including the image) and remove the "Contact Us" section (including the heading and paragraphs). contact.html -- You should be getting the hang of this now (if you're not sure you've got it right, keep reading: we'll show the altered markup in a moment). This time, we're removing the introductory spiel and the "About Us" section. Change the contents of the title element to read "About BubbleUnder.com: who we are; what this site is for." Change the level three heading <h3>About Us</h3> to a level two heading. In the process of editing our original homepage, we've lost one of our heading levels. Previously, the "About Us" and "Contact Us" headings were marked up as level three headings that sat under the level two "Welcome" heading. It's not good practice to skip heading levels -- an h2 following h1 is preferable to an h3 following an h1. Amend the contents of the title element to read, "Contact Us at Bubble Under."